The Project is a joint effort of the Academy for Jewish Religion, California; Claremont School of Theology; and the Islamic Center of Southern California. The new model creates a consortium that will train Christian clergy, Jewish rabbis and Muslim imams. In the future, the Project anticipates educating clerics of other world religions, as well. In making a case for the Project, Dr. Campbell stated: “The University Project represents the conviction that religion is not a competitive sport, that religion is not the tool of empire, and that religion is not a game of winner take all.” All well and good, but the more important question to answer is: What is religion? Stating what something is not is usually easy to do and often makes for good rhetoric, but rarely is it sufficient to explain what something is. I could tell you that religion is not a man in striped pajamas or a little teapot— short and stout—but in so doing, what have I told you that religion is? Absolutely nothing. Which religions were vying for influence during the Roman Empire? To name just a few, there was the Emperor Cult which proclaimed Caesar as a deity and demanded loyalty to him as a god. Another popular religion of the day was the worship of the mother-goddess of fertility Artemis. You may remember that Paul was attacked in Ephesus because his preaching turned people away from the fertility rituals involved in worshipping the goddess and the selling of her idols. And during the life of the early church, the Gnostic cults vied for position and influence, promoting their dualistic understanding of reality, teaching that many gods existed, and proclaiming that only certain human beings were capable of salvation and that not through grace, but through the acquisition of hidden knowledge. Would Dr. Campbell really have preferred that the early church not preach the Gospel and “compete” with Emperor cults, fertility religions, and belief systems that left many without hope of ever finding God? Those early Christians who often proclaimed the Lordship of Christ at great risk to themselves and whom many of us consider heroes, according to Dr. Campbell, they were guilty of turning religion into a winner-take-all, competitive sport. Stating what a religion is not is easy. Set up a straw man and knock it down. Draw some conclusions, and those who aren’t looking closely will believe that you have done something worthwhile. But the real task is to ask and answer the question: What is a religion? And how we answer that question makes all the difference. If religion is man’s attempt to find God, then fine, each one should plot his own course. If religion is the human search for meaning, then there may be as many paths as there are people. If religion is a set of moral values (instructions for how to live the good life and nothing more), what reason does any person have to believe that his or her ideas are better than anyone else’s? Maybe good folks should keep their views to themselves and certainly not evangelize others. But, of course, religion is something different altogether. A religion is a belief system that claims to provide valid information about spiritual reality. Every religion claims to give real and accurate information about what matters most: the nature and character of God and the human predicament and how it can be solved. And the Christian faith has always been clear in its proclamation (until recently when it became politically incorrect for some to do so): there is one God who created the universe and who made us in his image; who is holy and therefore cannot ignore our sin; who sent his Son Jesus to die for our sins so that we might be saved; and who says we may receive this gift by faith in Christ but we cannot earn it by performing good works or religious rituals. Dr. Campbell has stated that religion should be a force for compassion, not competition. But what is compassionate about knowing the way of salvation, revealed by God and bought with the blood of Christ, and not sharing that truth with those who are without it? If the Christian faith is the truth about what matters most—who God is, who we are and how we can live eternally with him forever—and in the name of tolerance or mutual respect we fail to do all we can to bring unbelievers to faith in the truth that can save them, how can we possibly claim to be compassionate? Truth always competes with falsehood. Science competed with alchemy. The germ theory and what became modern medicine competed with the idea that disease was the result of evil spirits. The fight for civil rights competed with the wrong and sinful notion that some persons were less worthy members of the human family than others and could be treated as such. And we are glad for the competition of truth against falsehood in each of those cases. And though it was disruptive for the moment, in each instance it was compassionate to defend and spread the truth. What the world’s religions teach about spiritual reality is so different from what Jesus revealed to be true about God and his plan of salvation that compassion compels us to proclaim the Gospel in hopes that all persons will come to know it. For it is the truth that sets us free—not religion; not wrong beliefs about God even if they are sincerely held; and certainly not the condemnation of faithful witnesses and martyrs in the past who spoke the truth when it would have been much easier to deny the uniqueness of Christ and his claim to be Lord—just as it is today. 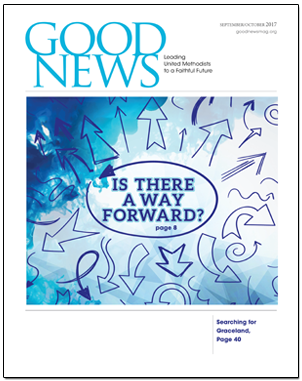 Rob Renfroe is the President and Publisher of Good News.